Most people plan their entire holiday dinner around the turkey. The decision of which type of turkey to purchase – fresh or frozen – is based on personal preference in taste, price, and/or convenience. 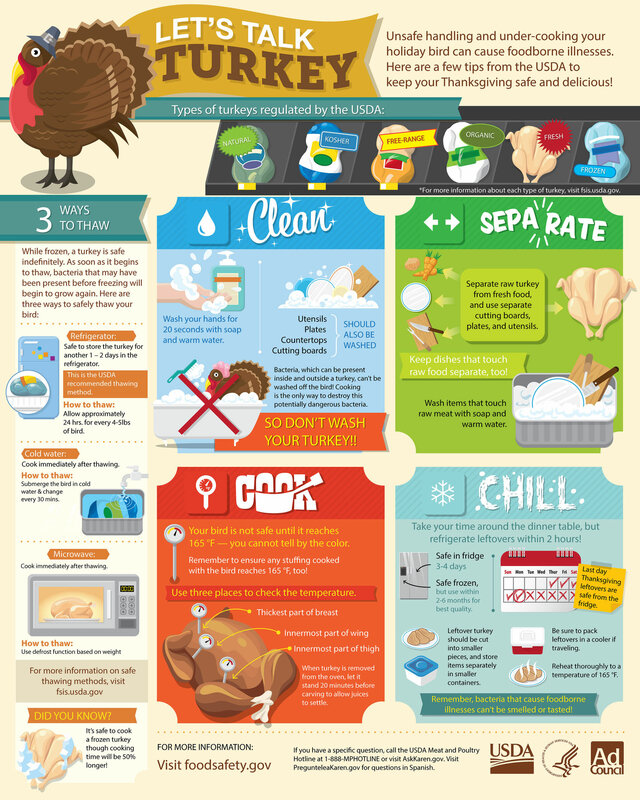 Frozen turkeys are flash frozen immediately after processing to 0°F or below and held at that temperature until packaged. They are more convenient to find and store until you need to cook them. 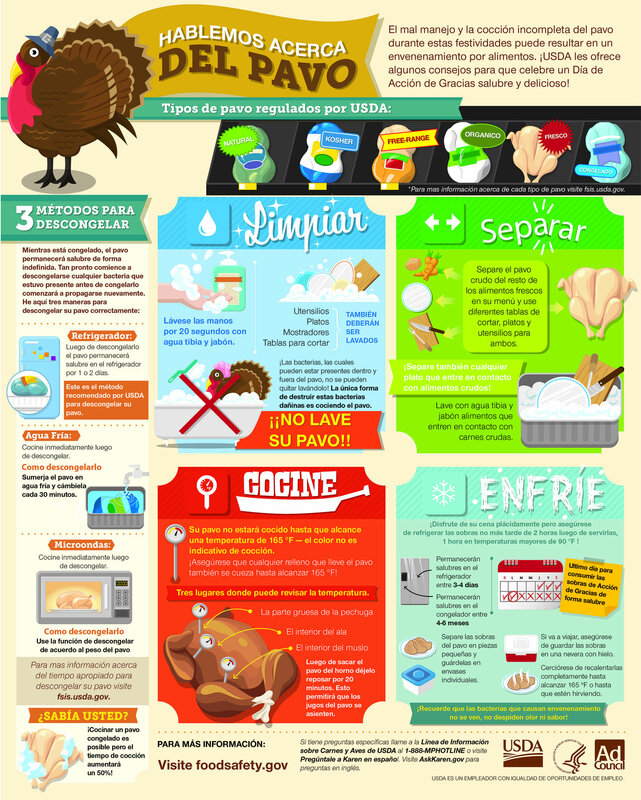 Turkeys are safe frozen in the freezer indefinitely; however, cook within 1 year for best quality. The meat, once defrosted, is virtually at the same freshness as the day it was processed. Fresh turkeys are deep chilled after packaging, hold their moisture better, and have a meaty texture with deeper natural flavors. They have a shorter shelf life (1-2 days in the refrigerator) and are, therefore, usually more expensive. 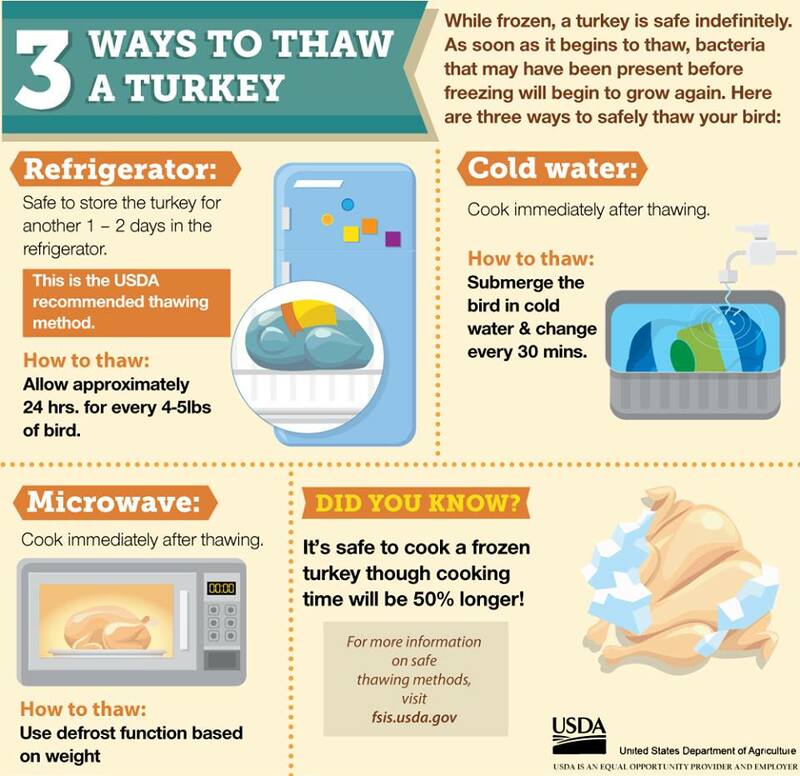 Whether you buy a fresh or frozen turkey, proper safe thawing, handling, and cooking of the bird will ensure a delicious holiday meal. 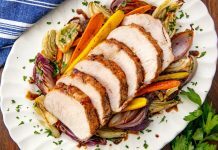 According to the USDA, a turkey is considered “fresh” only if it has never been chilled below 26°F to assure consumers that the turkey they buy has never been frozen. 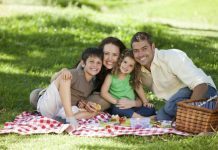 The bacteria “danger zone” is between 40°F and 140°F — the temperature range where foodborne bacteria multiply rapidly. 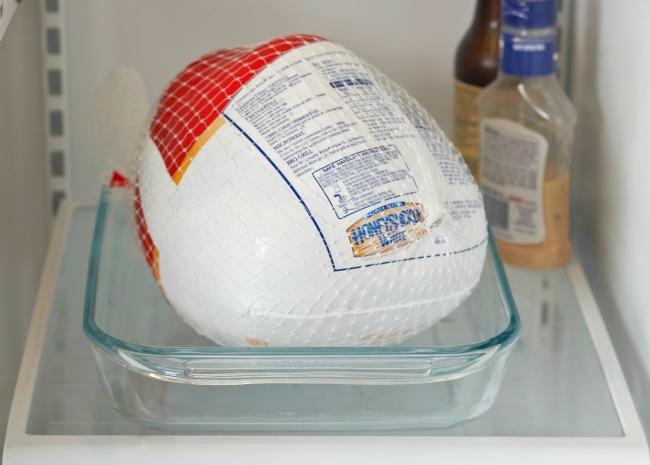 While frozen, a turkey is safe indefinitely, but as soon as it begins to thaw, bacteria that may have been present before freezing can begin to grow. 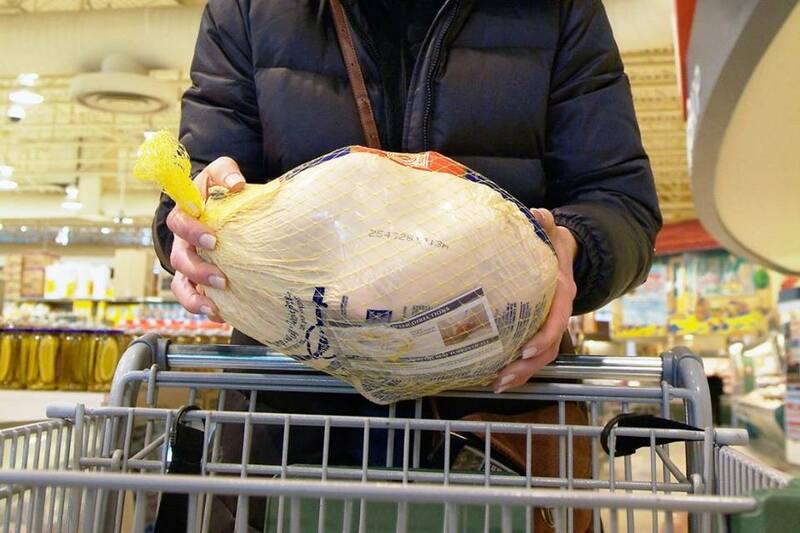 A frozen turkey left thawing on the counter more than 2 hours is not at a safe temperature. Even though the center of the package may still be frozen, the outer layer of the food is in the between 40 °F and 140 °F. 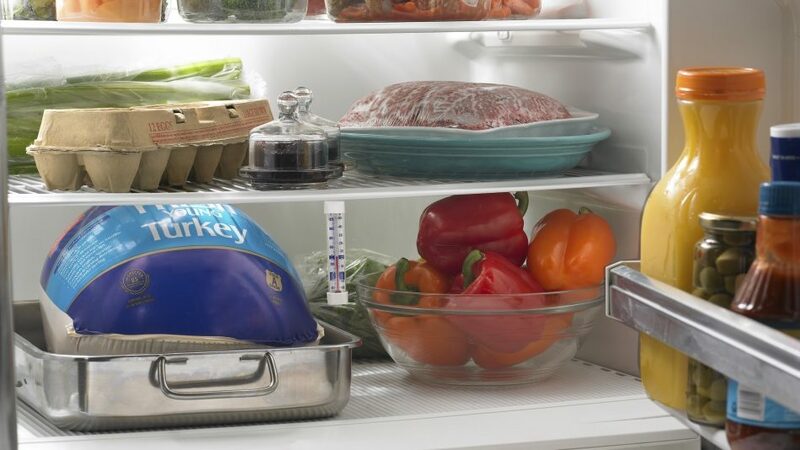 There are three safe methods to thaw a turkey: in the refrigerator, in cold water, and in a microwave oven. Follow the microwave oven manufacturer’s instruction when defrosting a turkey. Plan to cook it immediately after thawing because some areas of the food may become warm and begin to cook during microwaving. 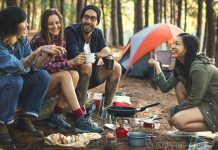 Holding partially cooked food is not recommended because any bacteria present wouldn’t have been destroyed. A turkey thawed in the microwave must be cooked immediately.